Analysis: Brown joined Washington's practice squad on Oct. 2 with the hopes of eventually making the 53-man roster. That ultimately never came to fruition, and Mack will now look to continue his NFL career elsewhere. Analysis: Brown is no stranger to the Redskins' practice squad, having been a key contributor to the unit back in 2016. Many close to the team have pushed for Brown's activation to the 53-man roster, but it seems like he'll need some things out of his control to go right in order for that to come to fruition. As it currently stands, Brown figures to be the No. 5 running back option in Washington until further notice. 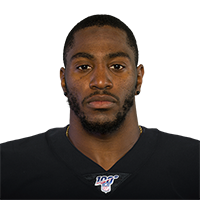 Analysis: Brown was waived/injured with an undisclosed injury by the Vikings last week and reverted to injured reserve after clearing waivers. The 26-year-old reached an injury settlement with the team and is now free to sign elsewhere. Analysis: Brown's situation remains clouded, but the running back is nonetheless stuck on IR through the end of the league year unless he agrees to an injury settlement. Analysis: Brown played four games between the Vikings and the Redskins last season, rushing eight times for 29 yards. He couldn't stay healthy this preseason, however, as he only played one game and rushed 11 times for 34 yards. If he clears waivers, he'll revert to injured reserve. Brown (undisclosed) participated in Sunday's practice, Chad Graff of The Athletic Minnesota reports. Analysis: Brown has been sidelined for nearly two weeks with an undisclosed injury that forced him to miss the last two preseason games. Now back at practice, he should be set to return for the team's final outing before the start of the regular season, but it may be too late for the tailback to make the final roster. Brown (undisclosed) remains sidelined for Friday's preseason game against the Seahawks. Analysis: Brown's undisclosed issue has sidelined him for well over a week, so it's not a huge surprise that the tailback will miss the third preseason game. He may be on the outside looking in for a 53-man roster spot, and missed time during the preseason doesn't help his cause. Brown (undisclosed) did not play in Saturday's preseason loss to the Jaguars, Matthew Coller of 1500ESPN.com reports. Analysis: Brown has been dealing with an undisclosed injury for about a week now, while Roc Thomas and Mike Boone have emerged in their battle for the No. 3 spot at running back behind Dalvin Cook and Latavius Murray. Brown is on the outside looking in with two preseason games remaining, though his status for Friday's tilt against the Seahawks is in question. Brown did not participate in Monday's practice due to an undisclosed reason, Chris Tomasson of the St. Paul Pioneer Press reports. Analysis: Brown didn't appear to have sustained an injury during Saturday's preseason opener against the Broncos, a game when he rushed for 34 yards on 11 carries. However, he was sidelined Monday due to an undisclosed issue. Any injury would hinder his chances of securing the No. 3 spot at running back behind Dalvin Cook (knee) and Latavius Murray, while fellow reserve Roc Thomas emerged with 131 total yards and two scores Saturday. Brown had 11 carries for 34 yards in Saturday's preseason win at Denver. Analysis: Brown averaged just 3.1 yards per carry while Roc Thomas had 131 total yards and two touchdowns. It's still early in the competition for the third running back job, but Thomas may have moved ahead of Brown and Mike Boone for the job. Brown is listed as the No. 3 running back on Minnesota's initial depth chart, the St. Paul Pioneer Press reports. Analysis: He's competing for the third-string role against Roc Thomas and Mike Boone in what should be a wide-open competition. Dalvin Cook and Latavius Murray are set as the top two backs, but both had injury issues last season (including Cook coming back from a torn ACL). The winner of the No. 3 RB role could have fantasy relevance at some point this season as a result. Brown will sign a one-year tender with the Vikings, Chris Tomasson of the Twin Cities Pioneer Press reports. Analysis: Brown played in one game for the Vikings in 2017 after being waived by the Redskins, returning one kickoff for 17 yards. The third-year running back will likely hold a depth role for Minnesota in 2018. Brown recorded eight rushing yards on four attempts while adding one reception for 11 yards through four games with the Redskins and Vikings in 2017. Analysis: Brown struggled to carve out a role for himself in Washington, which forced the team to waive the second-year back in late October. He was then picked up by the Vikings but was only active for one contest and failed to receive an offensive rep. The undrafted free agent will look for another opportunity to make a 53-man roster this offseason, although time may be running out. Brown (coach's decision) is inactive for Sunday's game against the Bengals. Analysis: Since being scooped up off waivers from the Redskins on Oct. 30, Brown has appeared in just one game for the Vikings, logging eight snaps on special teams. It looks like head coach Mike Zimmer is content just to keep two running backs (Jerick McKinnon and Latavius Murray) active most weeks. 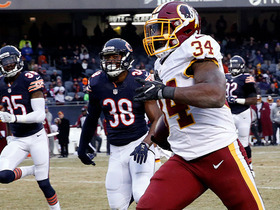 Washington Redskins running back Mack Brown rushes for a 61-yard touchdown.